How does one deal with seriously troubled but sensitive skin? That's been a problem of mine for the past several months now. Due to stress levels and changes in my environment, my normally sensitive but fairly clear skin has become congested and ready to break out at the drop of a hat. 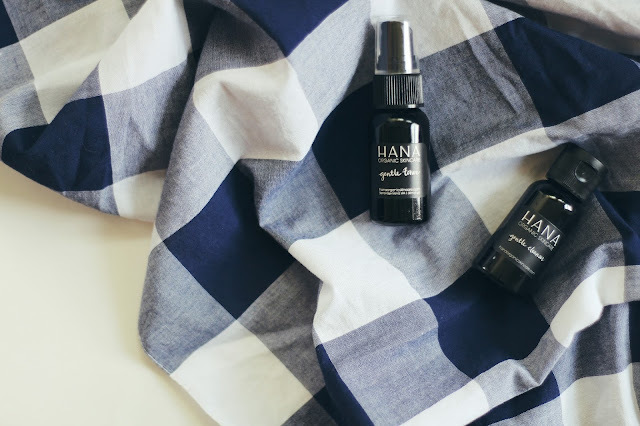 Because of this change I've switched out a lot of my stronger skincare for gentler and more natural formulas that are still effective but not quite as harsh - this included trialling a few products from the wonderful Hana Organics. It's a brand I had heard a lot about in the past and I was incredibly excited to try more from them. Two star products from the line are their Gentle Cleanser* and Gentle Toner*, two products that have done wonders for my skin without causing any additional irritation or harm. The cleanser is a fairly simple formula, containing ingredients such as rose hydrofoil, castile soap and jojoba oil to keep your skin clear and hydrated. It'a fairly water-y formula so you don't need much of it to really get the job done! I've been using it in the morning to refresh my face and following it up with the brand's toner to soothe, hydrate and, well, tone my skin. The toner contains powerful ingredients such as aloe vera, vegetable glycerin and essential oils of lavender and lemon. I like to just spritz a bit of it on my face right after cleansing and before moisturizing, as the ingredients help to restore your skin's natural pH level. My skin always feels instantly happier after a few sprays of this, and often I'll keep it with me throughout the day for a quick skin pick-me-up (which the travel size is perfect for). I follow up the toner with one of my favorite products from Hana, their truly dreamy Everyday Creme* SPF 15. Since making the switch over to green beauty I'll fully admit that I've become a bit of a facial oil addict - they're usually so lightweight and easily absorbed that I just hadn't seen a real need for a good old moisturizer. This gem is the exception. It's lightweight, superbly hydrating and even contains SPF 15 for some natural sun protection. It can easily be worn underneath makeup or by itself on a no-makeup day, and it contains a plethora of ingredients that will keep your skin happy long after you've taken it off. This is easily one of the all-time best facial creams I've ever used, and I fully intend to buy the full size for the dry winter months when I know my skin will need some serious moisturizing. Have you guys tried the wonderful Hana Organics before? Let me know if you have a favorite product in the comments below!